With the world championship already decided, the final grand prix of the season in Mexico City was a chance for the drivers to race without any pressure. 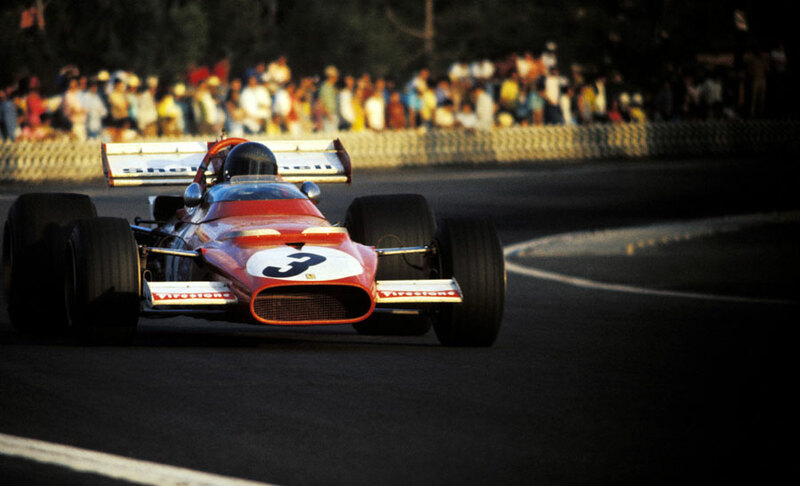 Jacky Ickx was victorious and finished runner-up in the championship standings behind posthumous winner Jochen Rindt. Former triple world champion Jack Brabham announced his intention to retire after the race, at the age of 44. An uncompromising and determined character, he was the only man who won a world title in a car bearing his own name, and he graced the sport for 15 years. Clay Regazzoni took pole for Ferrari, alongside Jackie Stewart, with Ickx and Brabham on the second row. The race nearly didn't take place and was delayed for over an hour while the massive crowd - estimated at over 200,000 - spilled over on to the track. After waiting for 40 minutes, Stewart walked away from his car declaring; "That's it. I'm not racing. I could kill someone." He was persuaded to return to his car as officials eventually got the crowd back to a safe distance. Regazzoni began in the lead, but was soon overtaken by his team-mate Ickx and was then pushed back into third by Stewart. This remained the order until Stewart retired on the 33rd lap with over-heating after hitting a dog. He looked shaken as he climbed out of his car: "I won't be going back into the race," he said. Brabham was unable to complete his last race, withdrawing with engine trouble when lying third, only ten laps from the end. Ickx was never seriously challenged and won comfortably, with Regazzoni making it a Ferrari one-two. In the closing laps the crowd began to edge ever closer to the action, and as soon as Ickx crossed the line, they invaded the track. People climbed the link fences which were topped with barbed wire and ignored requests from police and race officials to keep off the track where cars were still racing. Disaster was narrowly averted as the remaining cars slowed to a crawl as they made their way to the finish. It had been a tragic year for Formula One with the deaths of three drivers - Jochen Rindt, Bruce McLaren and Piers Courage - although Rindt had amassed so many points before his fatal accident that he still won the world championship. He was the first, and to date, is the only posthumous champion.